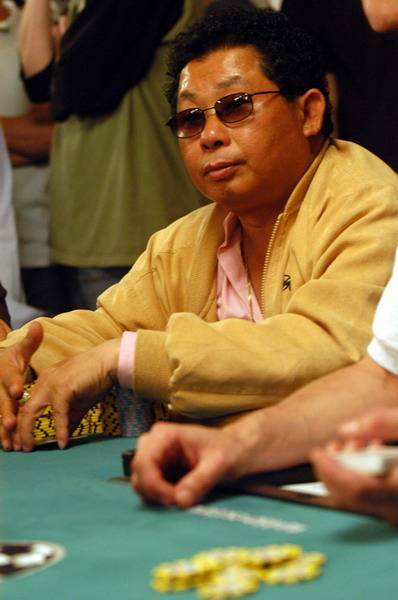 Can Kim Hua is a Vietnamese-American professional poker player who goes by the nickname “CK.” Nobody knows exactly how old Can Kim Hua is, but his birthday is known to be July 7th. Before moving to the United States in the 1980’s, Can Kim Hua was a fisherman in Vietnam. Today, Can Kim Hua is doing much more than fishing, he is considered to be a shark seeking its prey at the poker table. Can Kim Hua claims that he didn’t start the play poker until the year 2000, but since then he has managed to win more than a dozen poker tournaments, and has cashed in more than one hundred poker tournaments. Can Kim Hua doesn’t have any WSOP or WPT bracelets, but he has made money 10 times in the WSOP and 7 times in WPT, including 3 WPT final tables. One amusing event about Can Kim Hua occurred when he was playing in the California State Poker Championship in June 2004. A five-way deal had been struck to split the prize money and play for the trophy; however, the deal fell apart when CK saw the trophy. He liked it so much that he backed out of the deal until the other players agreed to declare him the winner and give him the trophy. Can Kim Hua resides in Rosemead, California, and among many other foods, seafood is his favorite delicacy.